"Reminiscences of a New Hampshire Town"
History does not record the name of the first white man to walk the soil of Belmont, nor do we know the date. We can assume that he came by way of the Merrimack and Winnipesaukee rivers, passing as he came scattered Indian villages on the shores of these streams. It seems likely that the exploration party sent out by Governor Endicott of the Massachusetts Bay colony in 1652 to find the source of the Merrimack River walked on what is now the soil of Belmont. 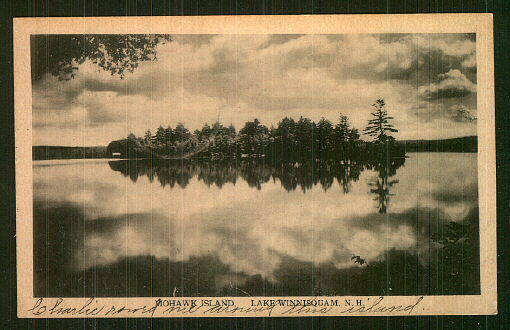 We do know that an important Indian village was located near where the Winnipesaukee River flows into Silver Lake. It was reportedly a gathering place for the Indians who came to the river to capture eels and, in the spring and fall, shad which passed this place on their migration to and from the ocean. The Indians placed weirs across the river at this narrow point and were able to take bountiful harvest of fish for food, as later did the white man when he first arrived. "Tradition informs us that a large body of Indians belonging to or inhabiting this region of country were once surprised and driven upon a point of land in the Great Bay, upon the Gilmanton shore where they were overpowered by a superior force and completely cut to pieces. The victorious Indians on this occasion were the Mohawks, and it is said , they used stratagem to decoy the Pekuawkets (feigning a retreat down the bay in their canoes, while really ambushed under the bank of the point) by means of which they obtained a more easy and complete victory. The place where this battle was fought is known as 'Mohawk Point'." It is not known whether Indians inhabited or frequented other areas of the town, but it seems unlikely that they more than hunted or occasionally traversed the area, and were mainly limited to following the rivers. Another likely possibility is that the first white man or woman may have come as a prisoner taken captive in one of the numerous Indian raids on the English settlements to the south and east. In all, six wars were fought with the Indians before New England would be safe from their raids, and before Belmont and the surrounding area would be safe for settlement. In these wars the Indians took terrible revenge on the settlers and in King Philip's War alone it was said that one eleventh of all buildings and one eleventh of the entire militia in the united colonies were lost. None of this fighting took place in Belmont because there were no settlers here, but nearby communities such as Canterbury and Penacook, which were then on the frontier, did not escape entirely. As was the custom in colonial times, townships were often granted to groups of individuals as reward for services to the Province. The practice was for the Governor, or Lieutenant Governor, as was the case in New Hampshire at this time, to reward friends and associates as well as those who served in the militia by granting them townships, of course always retaining a sufficient share to make the effort worthwhile. The proprietors or grantees of the township would then proceed to survey the town, build a grist mill, a saw mill, and a church to entice settlers to move into the town, with the end result that the proprietors sold their shares for profit, or could provide a homestead for their sons or themselves. The town of Gilmantown was a typical colonial grant in this manner, and was made to 24 persons by the name of Gilman and 153 others. We can assume that the grant was made as compensation for service in the Three Years of Lovewell's War which ended in 1726, and which was in a good part fought in eastern New Hampshire, Lieutenant Governor John Wentworth who signed the charter retained 500 acres as did Governor Shute, and two shares were retained for the Province. It appears that not all the proprietors were necessarily rewarded so much for service to their country as they were for being friends and associates of the Lieutenant Governor. The list contains many important names from the Portsmouth and Exeter area. At this point several of the readers of this page may be wondering why the town of Gilmantown is being discussed instead of Belmont which is supposed to be the subject of this book. A little understood fact must be brought out at this time to clarify the misconception that Belmont was once a part of Gilmanton. The contrary is true. 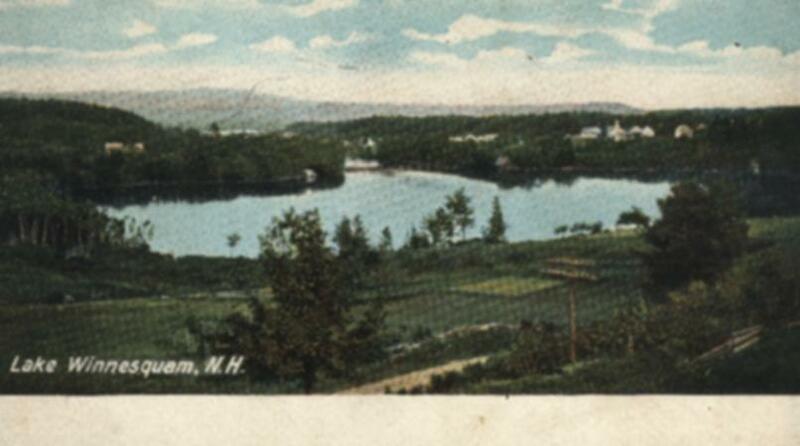 Gilmanton was once a part of the old town of Gilmanton which in 1859 changed its name to Upper Gilmanton, and ten years later changed its name to Belmont. Until the year 1859 the name Gilmanton applied to both the present towns of Gilmanton and Belmont, prior to 1812 applied also to Gilford. This leads to much confusion in the analysis of old records, including Lancaster's History of Gilmanton. The person doing historical research should bear in mind that prior to 1812 the term Upper Parish referred to both Gilford and Belmont, and that the term Tioga applied to the western part of Belmont. After this date the term Upper Parish referred to the present Belmont, and the term Lower Parish referred to the present Gilmanton. The following copy of the town's charter is taken from the proprietary records of the town which were begun at the time the charter was granted in 1727, and which to this day constitute a part of the official records of Belmont. The original wording is retained. George, by the grace of God of Great Britain, France and Ireland, King, Defender of the Faith, Etc. 1. That the Proprietors within three years shall build seventy dwelling houses and settle a family in each, or cause the same to be don, and clear three acres of ground fit for planting or mowing, and that each proprietor pay his proportion of the town charges when and soe often as occasion shall require the same. 2. That a meeting house be built for the public worship of God within the term of four years. 3. That upon default of any particular Proprietor in complying with the conditions of the Charter upon his part, such delinquent Proprietor shall forfeit his share of the said Land to the other Proprietors, which shall be disposed of according to the major Vote of said Proprietors at a legally meeting. Provided nevertheless that the Peace with the Indians continue for the space of three years. But if shall happen that a war with the Indians do break out before the expiration of the aforesaid three years - that then the said term of three years shall be allowed the Proprietors after the expiration of the War for the performance of the aforesaid conditions - rendering and paying us's, our heirs and successors, or Such Officer or Officers as shall be appointed to receive the same, the annual quit-rent or acknowledgment of one pound of flax in the town on the last Thursday in March, yearly, forever, (if demanded) - Reserving also unto us, our heirs, and Successors all the mast trees growing on said land, according to act of Parliament in that case made and provided. And for the better order, rule and government of said town, we Doe by these presents, for our Selves, our heirs and successors, grant unto the said men and inhabitants, or those that shall inhabit said town, that they yearly and every year, upon the second* Thursday in March, forever, shall meet to elect and chuse by the Major part of the Proprietors then present, Constables's, Selectmen, and other town officers, according to the laws and usages of our aforesaid Province, with all the power, privileges and authorities as other towns and town officers with our aforesaid Province have and enjoy. And for notifying and calling of the first town meeting we do hereby appoint Major John Gilman, Capt., John Gilman, and Barthelomy Thing to be Selectmen for the said town of Gilmantown, and they do continue in said respective office as Selectmen until the second* Thursday in the month of March, which shall be in the year of our Lord one thousand seven hundred and twenty-eight, and until other Selectmen shall be chosen and appointed in their stead in such a manner as in these presents expressed. Witness, John Wentworth, Esq. our Lieut. Governor and Commander in Chief in and over our said Province of New Hampshire at our town of Portsmouth, in our said Province, the twentieth day of May in the thirteenth year of our reign, Anno Domini 1727. *Although the original charter specifies Thursday the day should apparently be Tuesday. The bounds of this original grant included the present towns of Belmont, Gilmanton, and Gilford, as well as that part of Laconia which lies south and east of the lakes. The boundaries of the town would remain the same until the year 1812 when Gilford would be disannexed and made a separate town. It is therefore of necessity that the early history of Belmont must also be that of other areas which were included in the original township, except in those rare instance when we can clearly identify a person or place solely connected with Belmont. The following paragraphs give a brief synopsis of the proprietary history of the town of Gilmantown as it was originally constituted. This period extended from the time the charter was granted actual settlement, which took place some thirty-four years later. The delay was caused by the unsettled conditions with the Indians which persisted until the end of the French and Indian War in the early 1760's, when the Indians left the area forever. This information comes from two sources, the town's proprietary records and Lancaster's history. The first meeting of the proprietors was held in Exeter on March 4, 1728. (All meetings were held in Exeter until after settlement). At this meeting fifteen additional petitioners were added to the list of proprietors bringing the total to 192. At the 1730 meeting it was voted to petition Governor and Council for an extension of the time limit for settlement of the town. Also a committee was chosen to mark the town's boundaries, which was reported accomplished in March of 1731. At the 1732 meeting it was voted to lay out a section of forty-acre lots and to draw a plan of the town. In June the committee reported back that 236 lots had been laid out. (Lower Gilmanton). In 1736 it was voted to clear a path to he town and to build block houses. On November 23, 1736 the committee reported back that a path had been cleared and that block houses at White Hall (Lower Gilmanton) and the Weirs had been built. In 1737 it was proposed that up to twenty of the proprietors settle on their choice of lots and be paid 40 shillings by each proprietor. This proposition, however, was not successful. On March 9, 1738 a committee was chosen to lay out an additional section of forty-acre lots. This was accomplished in June and the committee reported that 177 forty-acre lots had been laid out (Gilford). It was again proposed that the proprietors choose lots and settle. Due to the outbreak of another Indian war, no further attempts were made to settle the town of another eleven years. On May 17, 1749 a committee was appointed to visit the town to perambulate the lines, rebuild the block houses, and seek a site for a sawmill. For the first time the name of Joseph Badger appears as a member of the committee. Joseph Badger's descendants would in later years have a prime place in development of present day Belmont. On June 12, 1749 the committee visited the town and proceeded to re-mark the bounds, and to mark a roadway from Whitehall (Lower Gilmanton) to the Weirs and to build a block house by the side of Third Camp Meadow (Site of Sawyer Lake). At a meeting on May 16, 1750 a committee was appointed to clear a cart path and to build a sawmill. (Apparently not accomplished). On June 20, 1752 the proprietors received a quit claim deed from the masonian Proprietors in exchange for 18 shares. The Masonian Proprietors of New Hampshire were a group which had purchased the rights of John Mason to any claims he might have to the territory of New Hampshire which arose from the early royal grant to Mason and Georges. This conflict of ownership clouded the early settlement of the state and was not resolved until this group known as The Masonian Proprietors purchased Mason's claim from his heirs. On March 12, 1761 a committee was appointed to lay out three ranges of 100 acre lots next to the Barnstead line and three ranges of 100 acre lots above the first section of forty-acre lots. On July 7, 1761 the committee reported back that this had been accomplished and then, as previously agreed, lots were drawn for two of these lots by the first forty settlers who would come forward. In October 1761 the iron works for a saw mill were brought to the town on horseback, and the mill was completed in July 1762. In the fall of 1762 a grist mill was built. These were both located in the area between Lower Gilmanton and Gilmanton Iron Works and were early abandoned as unpopular sites when population congregated in other areas of town. During the summer of 1761 several of the individuals who had selected their lots began clearing land and building camps in hopes of spending the winter in town. On December 26, 1761 Benjamin Mudgett and his bride walked to their new home on snowshoes. Mrs. Mudgett was the first white woman to come to the town, and she and her husband spent the night along, being only people in town. On the following day John Mudgett, a brother of Benjamin, and his wife arrive, and on January 10, 1762 Orlando Weed and his wife arrived. These three families remained through the winter without further company. This was the beginning of settlement of the town, which rapidly progressed from this time forward. At a meeting of the proprietors on April 19, 1762 it was voted to lay out the remaining parts of the town in 100-acre lots. The committee, of which Joseph Badger was a member, made its return in 1765, reporting that the remainder of the town had been laid out and that lots for the ministry, parsonage and schools had been selected. (The measuring chain was reported used in laying out these it was for many years owned by the descendants of Joseph Badger and may be seen at the Belmont Library where it is on permanent display.) These lots comprised what is now the town of Belmont, plus the remaining part of Gilford which was not previously laid out. The lots were divided among the shareholders so that each might have two, except for those which were reserved for the support of the ministry and schools. During 1762 seven families were added to the settlement, all of whom had selected their lots in the area nearest to Barnstead. By 1767 there were 45 families in the town. On the 31st of July 1766 the first town meeting of the inhabitants was held, and on March 12, 1767 the first annual town meeting was held. Most all of the early settlement activity took place in what is now known as Lower Gilmanton, which was the first part of the town to be enter after the long trek from the then settled parts of the province. It would be from this first concentration of settlers that the population would, in a few years, fanned out to settle the remainder of the town. Up until 1770 few roadways were laid out in the town and they were for the most part paths which followed marked trees. In 1770 by order of the General Court, the Province Road was laid out through Gilmanton, but the proprietors refused to meet the expense of its construction. The road was therefore constructed by Richard Jenness and John MacDuffie, agents for the province. A tax of L331 9s 5d, was laid upon thee town to pay the costs of the road and the selectmen were required to access every forty-acre lot 4s 4d and each 100 acre lot 10s 10d. All lot owners who did not pay had their lots sold to the highest bidder by the Constable on January 15, 1772. The list is long indicating that many lots changes hands at this time. The construction of Province Road was undoubtedly the first roadway through the present town of Belmont. A chapter on the origins of our town would be incomplete without mentioning the names of some of the first settlers to clear away the forest and build homes in Belmont. Included are names as Joseph Badger Jr., Israel and Jeduthan Farrar, Stephen Gale, Stephen Chase, Benjamin James, Col. Samuel Ladd, Col. Dudley Prescott, Henry Plummer, Abel Clough, Bartholomew Gale, Joseph Young, Dudley Gilman, Samuel Smith, Nicholas Folsom, John Lyford Esq., Josiah Ladd, Lieut. Jonathan Perkins, Josiah Weeks, Josiah Randlett, Noah Leavitt, and George Weymouth. The events and incidents that these individuals encountered in their move into the wilderness would undoubtedly fill numerous volumes had someone had the time to record them for us, but unfortunately this was not done. Our knowledge of these individuals is slight, and they are for the most part completely forgotten except for a road, hill, pond, or even a cemetery which bears their name. Many of these individuals as well as others whose names are not now known were soldiers of the Revolution and their experiences in battle would undoubtedly also fill several volumes. Lancaster in his history records that Lieut. Jonathan Perkins fought at Bunker Hill, Quebec, Saratoga, Monmouth, and Chemong. At Quebec he was prisoner and to lay in in irons for seven weeks before being exchanged. As an old man he must have many times told of his experiences as a young soldier, but unfortunately for us it is even difficult to find out exactly in what part of Belmont he lived. The following are some of the dates of construction of roads and bridges. Modern names have been used so that in most cases the location may be easily identified. This information has been obtained both from Lancaster's History and from town records and may not be entirely accurate. Regretfully several of our more important roadways are not included for lack of adequate information or ability to interpret that which is available. Belmont Village was not early settled, and in fact was not considered fit for much of anything in the early settlers. These individuals were looking for flat, fertile land which could be converted to farming, and since the village area was anything but suitable for this purpose, it was for the most part bypassed. This is not to say that some of the area was not farmed, but it was mainly on the higher lands outside the village where this took place. Even today one can imagine that the village would be for the most part too we and too rough to farm extensively. On the other hand, this area was not completely without good features, for it possessed a river with adequate fall to be used for power, and this feature alone, in the end caused the village to develop. Listed below are a few authenticated dates of early construction of buildings which are still standing in the town of Belmont. Undoubtedly several of the most important houses which should be listed are omitted for lack of documentation.